What’s the Matter with Empathy? At a time when “empathy” is more controversial than ever, a researcher explains what it is, what it isn’t, and when it fosters kindness and compassion. The number of papers about empathy in psychology journals has increased dramatically over time, even when accounting for the general rise of productivity in this field—about 50 percent. 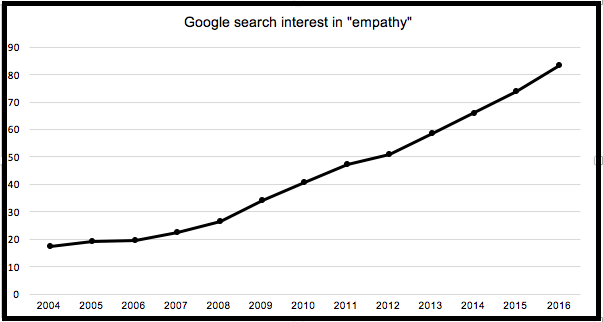 This scholarly investigation matches popular interest: The number of Google searches for “empathy” in the United States has steadily increased since 2004. Many of us see this as a good thing, because we see empathy as morally good. If asked, we would say that we want empathic spouses, children, friends, teachers, doctors, and bosses. And that we want to be empathic people ourselves. That is precisely why a recent book by Paul Bloom, with the provocative title Against Empathy, would catch our attention. In his book, Bloom argues that empathy can lead us astray by directing our compassion and generosity toward specific individuals, usually those who are part of our own group, at the expense of helping more people. He also argues that sometimes empathy can even fuel antisocial behavior such as aggression. I too have a problem with empathy, but Bloom’s book doesn’t capture it. The biggest problem with empathy, I think, is that people have trouble agreeing on exactly what it is. Far from being a problem for morality, however, I think that empathy can actually be a foundation of it—there’s compelling evidence linking it to kind and caring behaviors. But that depends on what kind of empathy we’re talking about. Bill Clinton, during a 1992 campaign event, famously responded to an angry AIDS activist by saying, “I feel your pain.” This is how Bloom often defines empathy in his book, as directly feeling what others are feeling. Imagine what the world would be like if this were the only way we could respond to others’ emotions, by feeling what they feel. We would all be a mess, shifting in and out of others’ emotions all day long. Now consider the words of another former president. When George W. Bush gave a speech at a memorial service for five police officers in July of 2016, he told the crowd, “At our best, we practice empathy, imagining ourselves in the lives and circumstances of others.” This definition, which Bloom also often uses in his arguments, no longer involves directly feeling others’ suffering. Instead, it involves imagining what it would be like for us if we experienced it ourselves. The discrepancy between Presidents Clinton and Bush isn’t explained by their political differences. Rather it illustrates broader differences in how people use the term empathy. In fact, one scholar has identified at least eight different uses of the term (yikes!). To understand what people may mean when they talk about empathy—and to understand whether empathy mostly helps or hinders moral behavior—here’s a guide to what some of these uses are. Emotional contagion is the form of empathy that President Clinton was describing, where we directly feel what others feel. This could be exhausting: It might overwhelm us and make us want to escape others’ pain rather than alleviate it—that’s why some researchers call this “empathic distress.” Even children show this pattern. So if Bloom is arguing that emotional contagion—characterized by feelings of personal distress—can cause less helping behavior, he’s not wrong. But it’s inaccurate to suggest that this is all that empathy is. Imagining yourself in others’ shoes, which describes how President Bush used the term empathy, is one of the other ways that people (including Bloom) sometimes define empathy. This involves mentally placing yourself in someone else’s situation or circumstance and imagining how you’d respond. Again, it’s unrealistic to expect that this will always lead to compassionate behavior. If a friend’s child dies, for example, imagining what it would be like for your own child to die could lead to overwhelming distress, which could make you want to avoid the parent in need of support. Daniel Batson, a leading researcher of empathy and moral behavior, has indeed found that this type of empathy produces feelings of personal distress. Perspective-taking is a cognitive form of empathy that was endorsed by an almost-president not long ago. In a 2014 speech at Georgetown University, Hillary Clinton stressed the importance of “showing respect even for one’s enemies, trying to understand, and insofar as is psychologically possible, empathize with their perspective and point of view.” This is the first example we’ve seen here of an “other-oriented” use of the word empathy, in which people imagine the world from someone else’s point of view rather than their own. Imagining a situation from someone else’s perspective is different than simply imagining yourself in that situation. Perspective-taking often requires actively listening to what other people tell us about their experience. If it is not possible to directly listen to them, then we can use our imagination to attempt to understand what the experience means to them, considering everything else we know about them. Setting aside whether or not you think we should do this for our enemies, research by Daniel Batson finds that when people practice this form of empathy, they’re more likely to help someone in need. This is because imagining others’ perspectives often leads to more feelings of empathic concern—which we can also call compassion. So does empathy make us help? When Bloom takes on empathy in his book, he mainly uses Bill Clinton’s definition of the term, not Hillary Clinton’s. A recent paper of his found that what he labels “empathy,” which I’d call “emotional contagion,” is associated with more personal distress. So it’s not surprising that it predicts less helping. Yet that same paper—and a considerable amount of other research—has found that compassion (or “empathic concern”) does predict more helping behavior. This is why I’m against using the blanket term “empathy” instead of more precise language. Studies of college students find that perspective-taking can help us open our hearts to people who may be different from us: It can promote more positive attitudes and increase helping behavior directed toward people from stigmatized groups, such as disabled people, AIDS patients, and homeless people. In general, perspective-taking and empathic concern are also associated with lower aggression and bullying. But the results of this research are not entirely consistent. Bloom presents one paper as evidence that empathy causes increased aggression. And the paper does find that empathic concern can lead to increased aggression, but only among some people (those with a certain gene) and only in some situations (e.g., when a loved one was very distressed by being hurt by others). The paper also found that in some people (those with a different gene) empathy actually predicted decreased aggression. This study provides important insight into the moral implications of various types of empathy, but in a more nuanced way. I should note that trying to take other people’s perspectives does not always produce morally good results. For example, we are not always accurate when we try to read other people’s emotions and imagine their perspectives—some of us are better at it than others. Also, perspective-taking doesn’t always have the intended effect, even among well-meaning people. For example, when white people are asked to imagine the perspective of a conversation partner from another ethnic group, they become worried about how their partner sees them, which makes them less able to connect with that person. However, like the aggression study, this only seems to be true for some people (ironically, those low in prejudice); in fact, perspective-taking does seem to make people high in prejudice act more positively toward members of another group. Another problem with perspective-taking is that even if we are accurate, it could be used to harm rather than to help others. For example, good salespeople can guess how much their customers want something and can adjust the price accordingly. And people with psychopathic tendencies are often good at perspective-taking but lack empathic concern—so they can gauge how to manipulate people without concern for the consequences of their actions. But in most people, perspective-taking and empathic concern are highly correlated. And Batson’s research suggests that perspective-taking is usually a reliable path to inspiring feelings of compassion for others. But what about the charge—leveled by Bloom and others—that empathy can sometimes lead us morally astray, fixing our compassion on people who feel physically or emotionally close to us? Bloom even points out that, at times, imagining others’ perspectives and feelings can move people to do things that they believe are unfair in order to help someone in need. For example, he describes a study that found that participants induced to take the perspective of a sick child wanted to move her to a higher spot on a waiting list for treatment. This is indeed a moral quandary. But the solution is not to “banish” empathy from our minds, if that were even possible (which it’s not). Doing so would throw the baby out with the bathwater; empathic concern is still vital to the kind of care and moral commitments that motivate moral action in the first place, whether toward a single individual or toward entire groups or nations. Instead, it’s useful to recognize the ways that empathic concern can sometimes lead us to make questionable decisions—so that we can guard against some of these problems while still harnessing its potential for good. Sara H. Konrath, Ph.D., is an assistant professor of philanthropic studies at the Indiana University Lilly Family School of Philanthropy, where she is also the director of the Interdisciplinary Program on Empathy and Altruism Research (iPEAR).